Darwins Pearl Jewellery shines with the quality of the best South Seas Pearls and dedicated jewellers. Pearls grown in the pristine waters of the Northern Territory are unsurpassed in quality and in demand from jewellers world wide. Jewellery made specially to exhibit the sheen and beauty of Darwin's best pearls is available from several retail jewellers in the shops and markets. You can have your own unique design built for that special occasion or choose from hand crafted designs built by people who are passionate about the beauty of locally harvested pearls. One of the outstanding designers of jewellery sculpted from precious metals and pearls is Gaynor Beck of The Pearl Galleria. After winning the Young Achiever of the Year Award in South Australia, she has since made her home in Darwin and now proudly offers her unique and affordable jewellery through the Galleria. Paspaley Pearls is the oldest of the Darwin pearl companies and has a retail outlet in the Paspaley Building, Smith St Mall which offers products made from the companies pearls. These three fine gems show why Darwin pearls are so highly prized. 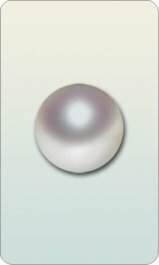 This large and fine Paspaley Pearl is the most recent find in this collection. It was harvested from the Pinctada maxima off the coast of northern Australia in 2002. Executive Chairman of Paspaley Pearls, Nick Paspaley, describes this pearl as "unequivocally the most exceptional gem ever harvested by Paspaley Pearls, and possibly the finest large pearl of all time!" These natural drop shape pearls are considered highly desirable and quite extraordinary. When one occurs it is unusual. When two occur, it is historic. These natural drop shape pearls also have a clean surface or skin along with a fine luster, adding to their rarity and desirability. 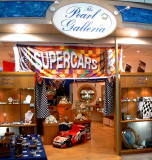 This showroom carries an extensive range of jewellery reflecting the international interests of the pearling industry. Exhibits include Freshwater, South Sea, Mabe, Keshi pearls and mother of pearl products. Designs are contemporary and superbly handcrafted with necklaces, earrings and pendants among the quality pieces. Return from Pearl Jewellery to Enjoy Darwin.